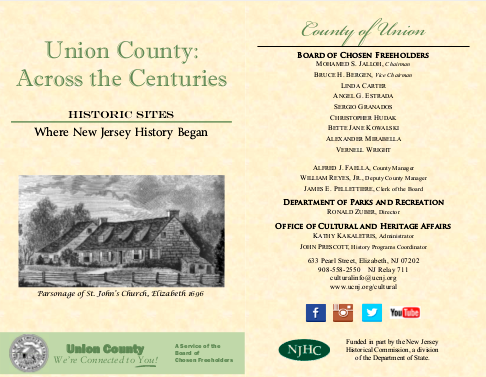 New Jersey is celebrating 350 years of history in 2014. How do YOU plan to celebrate? 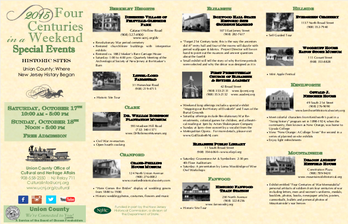 The Plainfield Historic Preservation Commission serves to identify and protect Plainfield's historic homes, religious and commercial buildings, historic sites and entire districts throughout the city. Advocates for and promotes historic preservation as a sustainable strategy to protect and enhance the vitality and heritage of New Jersey's richly diverse communities. 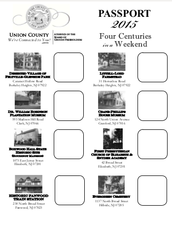 A state-wide, private, non profit historical museum, library, and archives dedicated to collecting, preserving, and interpreting the rich and intricate political, social, cultural and economic history of New Jersey to the broadest possible audiences. Connecting the people and places of New Jersey's rich Revolutionary heritage to inspire community pride, stewardship and civic engagement. Develops county wide programs and promote public interest in local and county history, in the arts, and in the cultural values, goals, traditions of the community, the State and the Nation. Gives the past a future by preserving and restoring historic sites with an emphasis on early Dutch and American heritage. Advance historic preservation in New Jersey for the benefit of future generations through education, stewardship and financial investment programs that save our heritage and strengthen our communities. Authorized under the National Historic Preservation Act of 1966, the National Register is part of a national program to coordinate and support public and private efforts to identify, evaluate, and protect our historic and archeological resources. Properties listed in the Register include districts, sites, buildings, structures, and objects that are significant in American history, architecture, archeology, engineering, and culture.